We're in the midst of a convention drought here in Florida, gang; nothing since December, and the next big one isn't 'til May! DON'T THESE PEOPLE KNOW WE HAVE NEEDS?! I mean, do you know how long it's been since I took pictures of people in body paint carrying comically large space weaponry? TOO LONG, that's how long. Anyway, since cons are also where I find most of the new art I feature here, this month I'm going to switch it up and show you a different kind of art I've recently become obsessed with: RESIN. 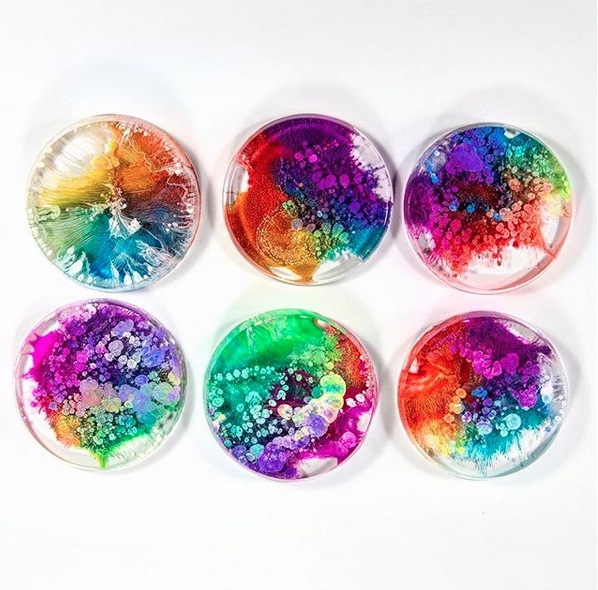 Josie has perfected the art of capturing these color explosions inside each clear resin disk, and she even has a Youtube channel now where she shows you how to make your own. 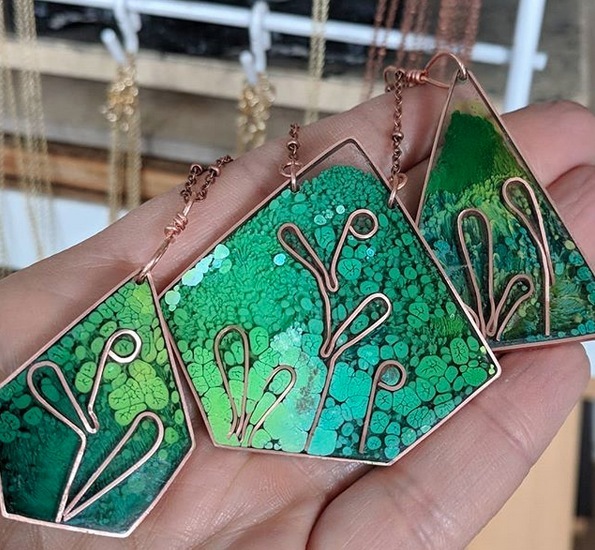 The secret is alcohol inks, dropped into the liquid resin before it cures. Be sure to follow Josie's Petrified Rainbow IG account for lots more like these - and I also recommend her original art account for the best assortment of soothing rainbow timelapses anywhere. I hit a bunch of snags: everything from using the wrong molds to having too-thick ink, but I still had a few startling successes. I started thinking, "hey, these would be cool necklaces! I wonder if anyone else has tried that?" Look at those inner shadows! AH-mazing. Caitlyn also makes them in several different shapes, including bees! 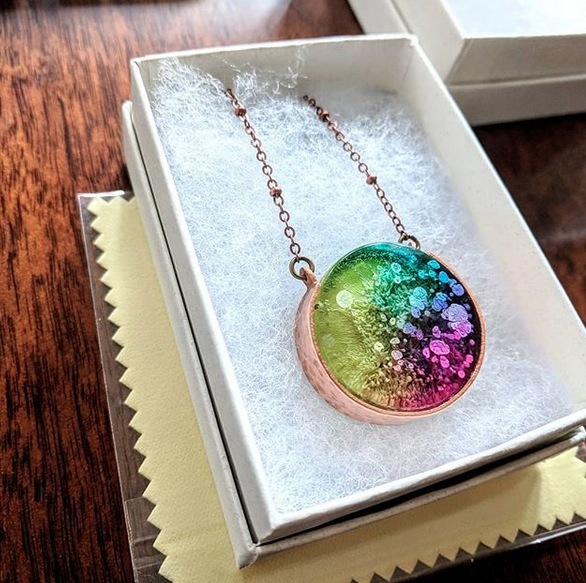 Go give her a follow, then check out her Etsy shop to grab your own shiny. Here she's combining an acrylic "dirty pour" with resin, which gives all those incredible color swirls. Plus she has paintings, nightlights, even phone pop sockets! All the grabby hands. ALL OF THEM. These finds are gorgeous, thank you for sharing! I'd like to be entered in to receive one of your lovely art pieces please, and the steampunk octopus dance is adorable!These finds are gorgeous, thank you for sharing! I'd like to be entered in to receive one of your lovely art pieces please, and the steampunk octopus dance is adorable! I love those! Especially the last artist! 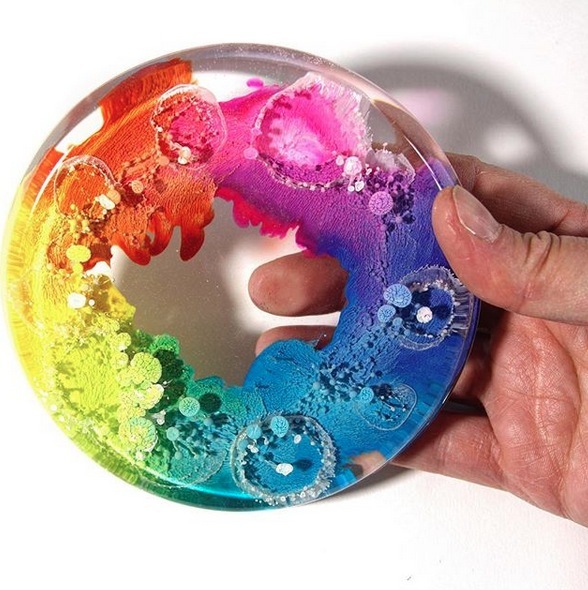 These make me want to go grab some resin and inks right now and have a go myself, so pretty. I want to try and make all the things, but thankfully I know better. I love that Harley print! I want to try those things but I never know where to start! It looks so dauting! I love the concrete necklace! Also, would love to also be in for the octopus drawing! you always find the best stuff. I have a few empty walls in my house that I am tempted to fill completely with fun art, but I need to start collecting! I'd love either print, or the wild card. 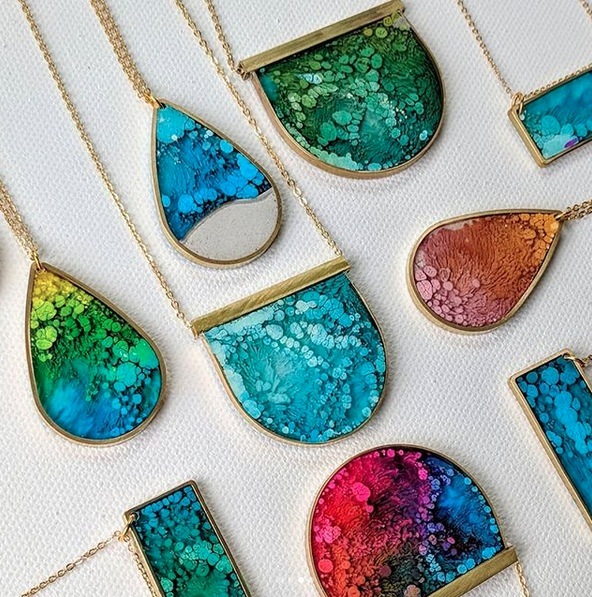 Gorgeous resin pieces!! Beautiful ! Enter me for the wildcard plus the other drawings ! I would LOVE the steampunk octo dance! Off to look at pretties on Instagram now! OMG these are mesmerizing, how have I never seen them before?? Forgot to note - I’m game for the wildcard drawing, love all the Toothless prints and the Star Wars artwork! I'd love to be entered for the wild card drawing and the and the octopus dance as well! Thank you! Put me in for the Wildcard drawing, please. 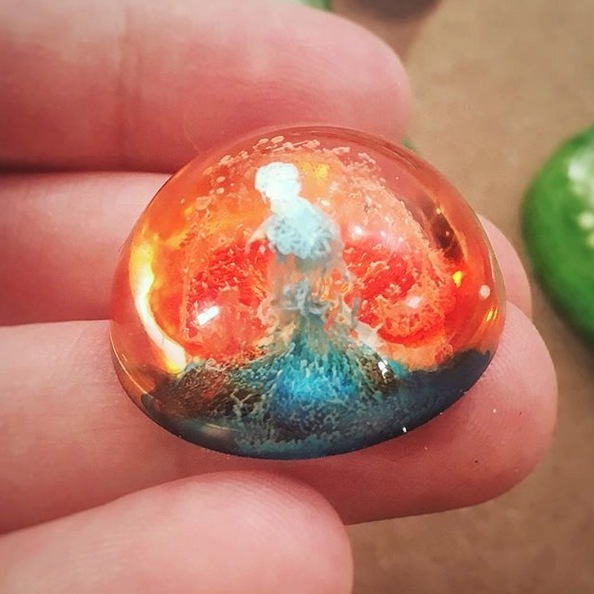 Wow, these resin artists are way talented! I'd love the steampunk octopus dance or the wild card! I'd love any piece of art, pintrest board, or the two specifics! As always, you find the greatest stuff to feature! 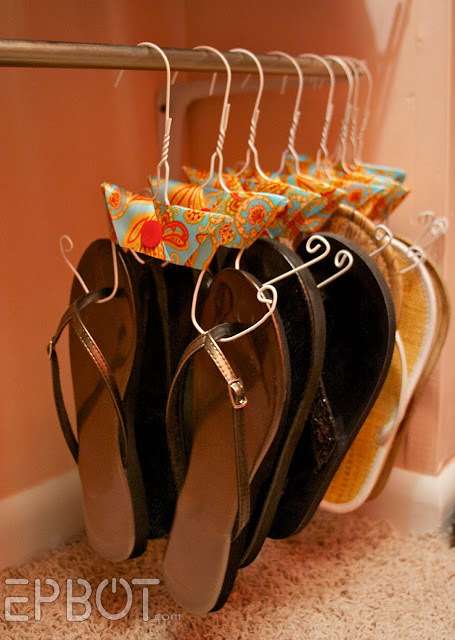 I can think of 4 or 5 things from the Pinterest Board I’d like! Oooh, yes, wild card please. Must but one of those necklaces! Also would love some art and a chance at Harley's painting. 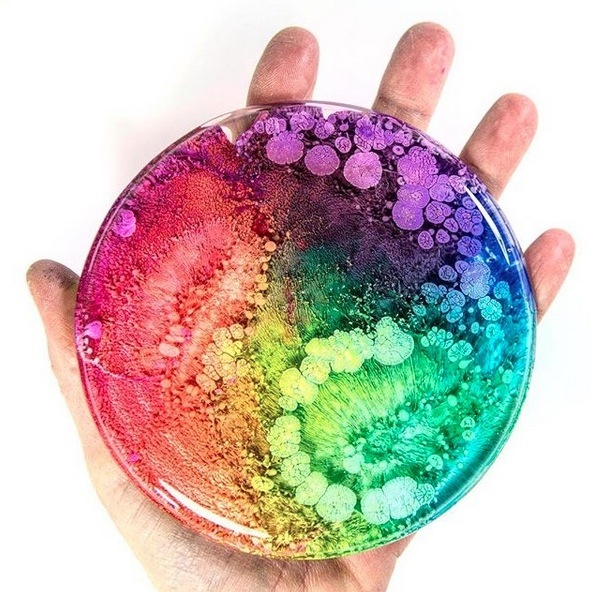 Wow, they really do look like rainbow mould/bacteria filled dishes! Wow! Those are absolutely beautiful! <3 Please add me to the Steampunk Octopus Dance and wildcard drawings please :). These are gorgeous! Gonna go scope out some of that jewelry. And put me in the wildcard as always, please! Just wow... and also Wild Card drawing, please!! Anything with bright colors is a win in my book! I love the Steampunk Octopus! 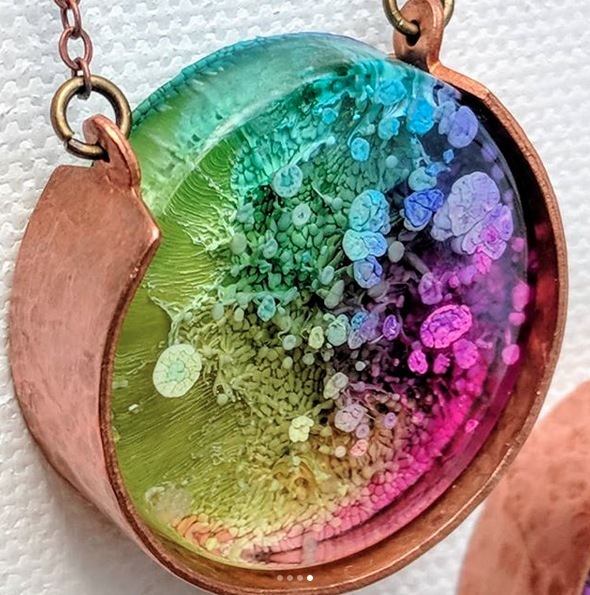 I love the resin art. So beautiful! The octopus art is also very cute! 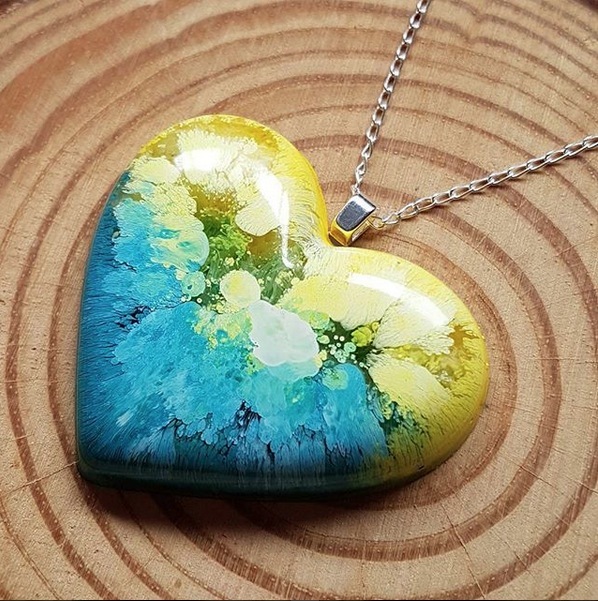 Love the resin art! And I LOVE the steampunk octopus! I'd love to be in the entry for the wild card and for the steampunk art! Thank you for sharing these awesome resin pieces! GORGEOUS! The jewelry blows me away- so beautiful. 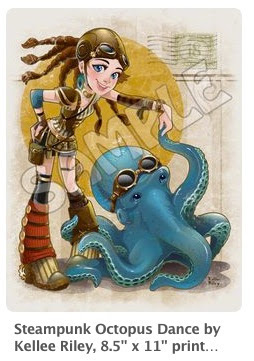 And I love the Steampunk Octopus! Oh my goodness, those are beautiful! I love all the swirls of color...just stunning! Beautiful Jewelry! Please enter me for the wildcard. Those are ridiculously pretty!! I would love to be the wildcard winner!! My husband and I just started a geeky art wall, and it could use another piece! I'd love to be entered into the wildcard drawing! I'd love to win the Steampunk octopus for my sister's birthday. She just made my 6 dancing wolves for "Beauty & The Beast" so she deserves a nice reward. If you love Rosa Muro's work , check out Josh Simpson's blown glass worlds. AMAZING! Wow, those resin things are gorgeous! It makes me want to try the technique (because I need another hobby right now like I need a hole in my head). Please enter me for the wildcard drawing. Thank you. I tried resin... once. Never again, my fingers and my kitchen table have never been the same! Never tried resin before but would love to in the near future. 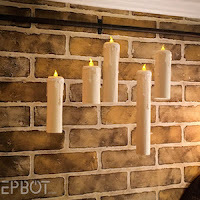 Looks so cool to try. Both art prints are amazing. 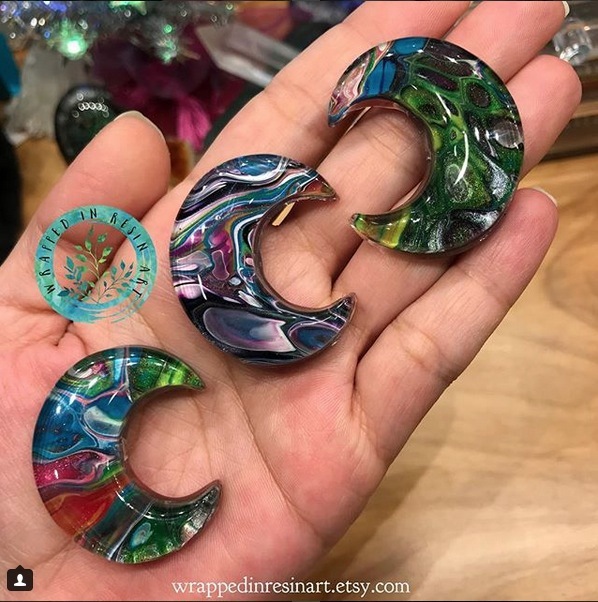 These resin pieces are sooooo pretty! Please enter me for both art prints, and the wildcard! 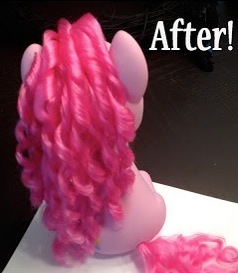 I so want to try doing something with resin! I hate being too poor to craft! These are all gorgeous! For the art giveaway I love everything Dr Who, Steampunk, Marvel, DC or Art Nouveau. That steampunk octopus dance and Harley are both great! 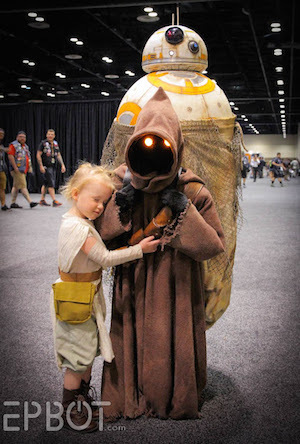 I love your art roundup! The concrete resin is amazing. Oh, I'm so in for all of the art drawings, but that steampunk octopus dance is so cute! Beautiful! The way the ink forms "strands" in the resin reminds me of the extreme close-up photos of peoples' eyeballs. I don't know if it would be technically possible to do, or how much control you have over the ink, but a giant resin eyeball would be so cool! 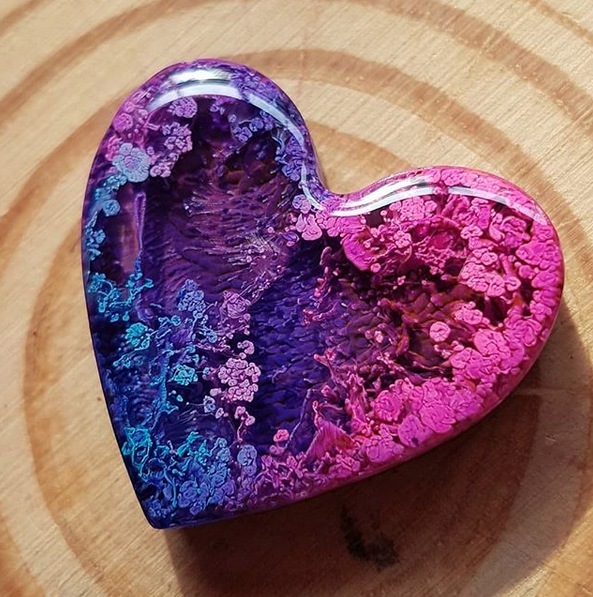 These resin pieces are gorgeous! Loving Steampunk Octopus Dance and all of the Star Wars art on your board (particularly the AT-AT Walk...my youngest has a similar shirt that is his favorite). The resin are is gorgeous! I really want to learn how to play with resin some day. I have resin and I have Alcohol Inks, now just need some talent from somewhere. Thanks for showing this new (to me) craft. Still hoping to win a Doctor Who poster one month. The resin looks amazing! Please sign me up for the giveaway board drawing. Well this whole post made my soul happy - which is much needed right now. Thank you. And I love both the octopus and Harley Quinn prints too! This makes me want to break out my resin for sure. And i’d be happy to win any of the art pieces. Please sign me up for the main drawing and the octopus. I love the resin, but I think I definitely do not have the patience for it. I need Harley Quinn in my life, I collect her! Oh my goodness, those are gorgeous and make me wish I actually wore jewelry. I could always just display them though. Hmmm...you've got me inspired! I would love to be entered in the main drawing and for the Steampunk Octopus Dance. He's so stinking cute! Omg ... I love these. Off to go shopping! Wow. I am so impressed with those resin pieces! Please enter me in the octopus and wildcard drawings! These are so freaking cool! Thanks for sharing! I love all the swirly colors! Thanks for sharing. Please enter me in the Wild Card and Harley Quinn drawings. If you like resin art, check out Positive Couple on facebook. 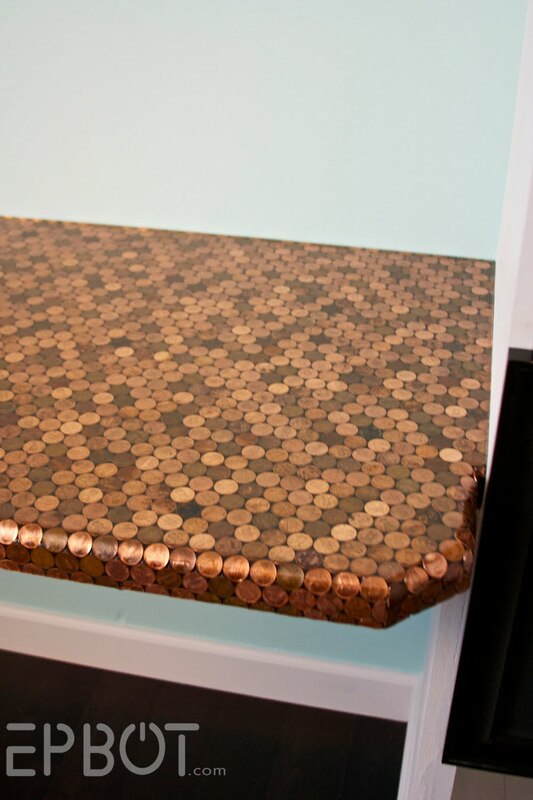 They make interesting furniture combining wood, resin, glass, and metal. Last week they even used vegetables! All the shiny rainbows! The octopus print is also super cute! I need to hang the terrarium ones in my windows. That octopus is super cute. I can't get enough of the colors! Love that each one is unique too! Great roundup! That's a lot of resin. I'd love to get the octopus dance. 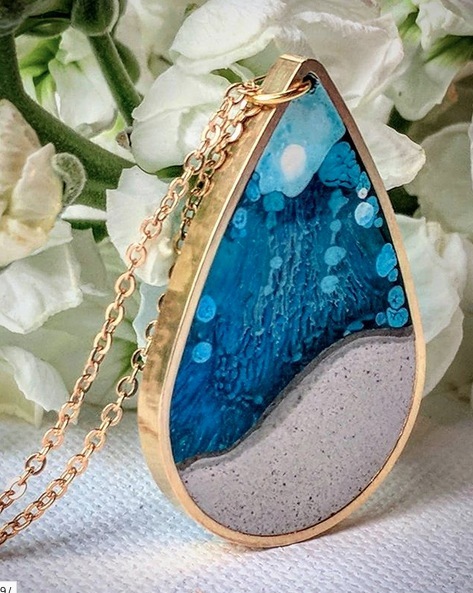 That resin jewellery is awesome! And I'd love either print! Ack, those colors! I love the one where they used concrete to make a beach. Please enter me for the wildcard drawing, thanks! These are definitely making me want to play with resin! These are super gorgeous!! 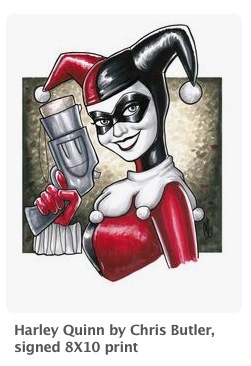 Also, that Harley Quinn art is perfect for the obsessed Harley fan (me)! Ooo shinies! Enter me for the steampunk octopus as well, please! Thanks to your lovely influence, I've started using the phrase "grabby hands" IRL! ^_^ Would love the chance to win in the wild card as well as both the dancing octopus & Harley prints. As always, thanks so much for sharing your wonderful finds!!! I like everything this month - and I want to go spend money on Etsy on all the things...! It's the best sort of dilemma. Thank you! The resin stuff is cool! Just a wildcard entry for me this month. I've been loving your experiments on Instagram. Can't wait to see more! Those resin pieces are all stunning. I'd love to try making some of them one day. If I'm lucky enough to be chosen, I'd love to have the Travel by TARDIS poster please. I've wanted to try resin, but I'm intimidated by it! I just need to dive in. Please enter me for all 3 giveaways. Thanks! My daughter LOVES Harley. She’d flip if I won that for her! I love the last set of resins. There remind me of moss. Also adore the Harley. I really like the octopus picture. Wow, I love all of the pretties. Throw me in the drawings, please!! Please add me to the wildcard and the Harley drawings. Ooh! Please enter me in for the Steampunk and octopus dance! Also I love alcohol inks! I love the Belle print by Bi Pri Art. I also love the steampunk octopus dance. 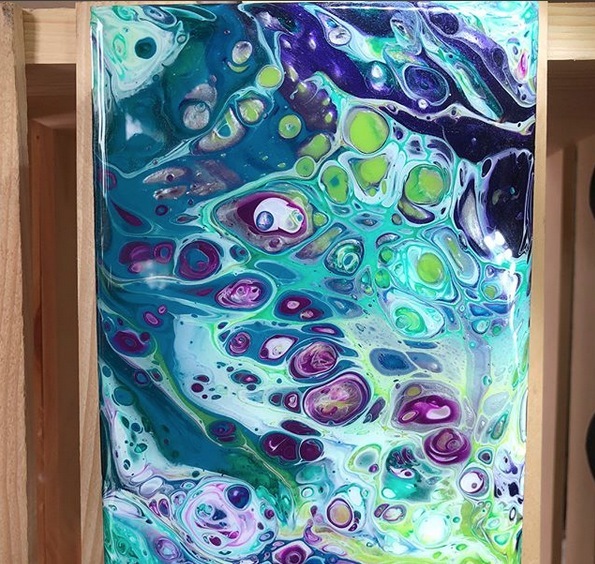 I recently just got my own piece of resin pour art, it’s so fun! I’d love to be entered in both wildcard and Hayley! Very fun! I would love to give a home to the octopus! Those were so cool!! I love the steampunk octopus!!! I'm still crossing my fingers for the wild card pick. My boyfriend and I have been talking about messing with resin because of all the gorgeous pots with wood all over imgur... now I have to add this to the list too! 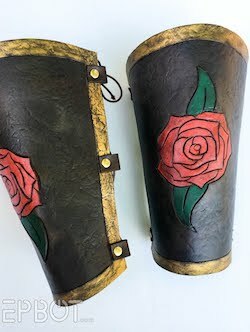 Open question for anyone and everyone who has done resin work: Does anyone know of a good resin for people with sensitive skin? 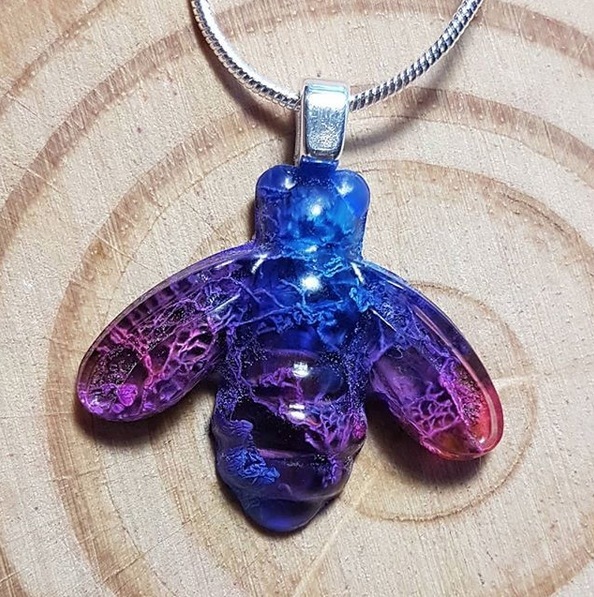 I have only tried Alumilite Amazing Casting Resin, and while I've had success with it, I find that it makes my skin break out into a very itchy rash if even a drop of it touches my skin before it cures. I really enjoy doing resin stuff (So satisfying when you pull out a successful cast! ), but I can't keep risking becoming the Phantom of the Opera every time I use it. If anyone knows of a better alternative, I would love to know! 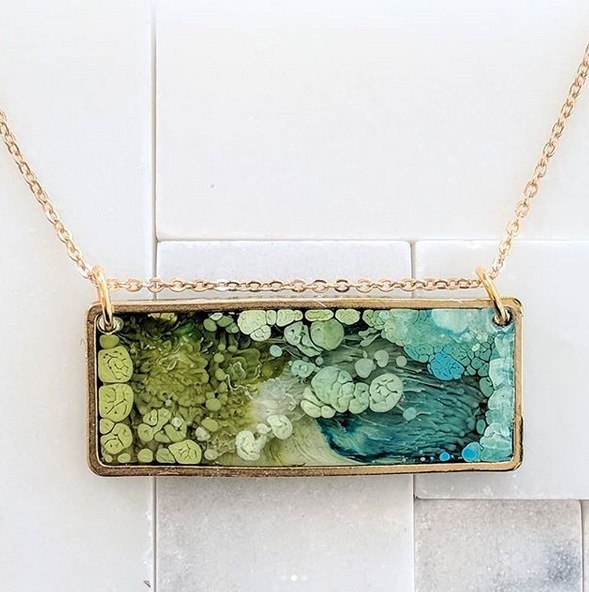 Obsessed with the resin and metal jewelry! Love that Rocket to the Moon on the Pinterest board. Omg I neeeeeed that dancing octo print! Please sign me up for that give away! Oooh, the rainbows are candy for my eyes! All of the pretties! I’d love to win either of the extra pieces of art as well! I love Cute as a button! It's gorgeous. My daughter would love it on her bedroom wall! Wooo! Sign me up for any and every! I love the steampunk octopus! Reminds me of Otto and Victoria. I'm crying right now. I'm in shock and in disbelief that I was featured in an article. Thank you from the bottom of my heart. It is truly soul enriching to see my art finding it's way to every corner of the world. These are all beautiful, but there is also something unsettling about the texture inside lol. I think it's lovely from afar but I can't look at them close up lol. Alcohol inks are great, but they're not lightfast so you should look into UV protecting varnishes. 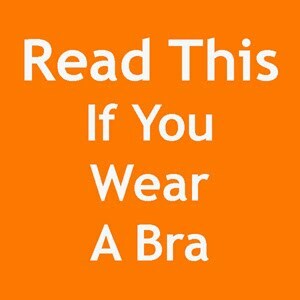 Just a heads up. I could go for the wild card! Thanks for everything! I have all the stuff for resin in my big pile of crafts-to-try...you know, the one I keep ignoring! And the TARDIS art prints are calling my name! 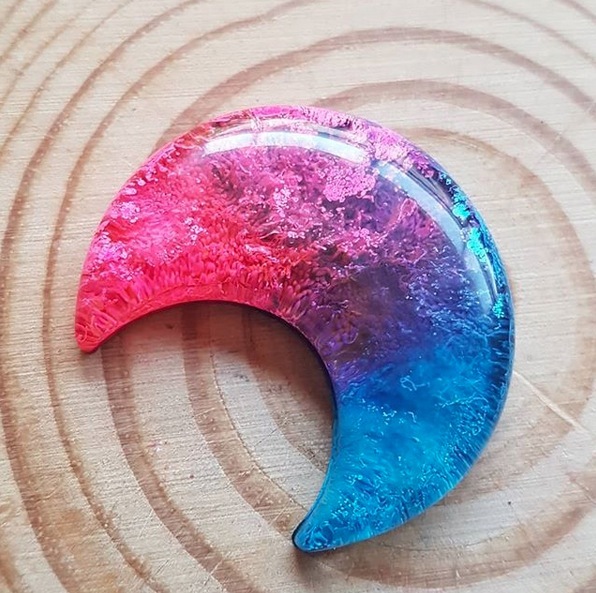 Aargh, I've just self-imposed a ban on trying new craft stuff until I've reduced my stash, and then here you are, forcing me to go buy resin and alcohol inks because these are SO GOOD. 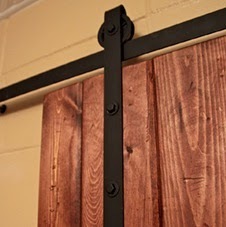 Makes me want to try it out myself... love this!! Steampunk octopus!!!!! Plus all the rainbows! So much love. Please throw my hat into the ring for the wild card and octopus print! Love all the colourful resins! Would like the Harley Quinn print too :D! Put me in the wildcard draw please! I can't wait to see what else you do with resin. Off to check my bank account and Google how to make resin and ink pieces.... Love the pieces on your art board, especially the Stanley Morrison and the Tiki Room pieces. Your wild card octopus is adorable too! Please enter me to win all the things! 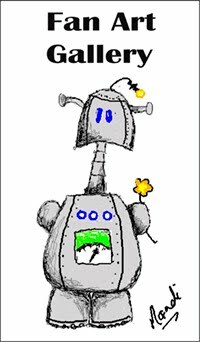 The little steampunk octo is beyond cuteness and would really make my day to win. All the rainbows! All of them! And the terrarium pendants! Must. Not. Buy. Must. Restrain. Oh my, those resin pieces are beautiful! Yes, that's a rabbit hole worth going down. I'm glad that you tell us it takes a lot of practice and trial and error for these projects. Of course the artists make the final project seem so easy. That's why we have artists! I'm looking forward to seeing the results of your experiments. 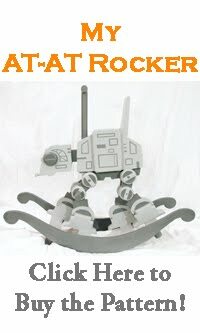 I would love the AT-AT Walk print!